I’m particularly partial to anything with a Mariachi on it (if you can find a good cheap one in NYC, please let me know, I’ll be 30 in a few years and I’m planning a party). Vosges Chocolates offers their Red-Fire Toffee here, one in a slew of delictable products with a twist + they manufacture, package, and ship green. Also love the packaging and flavors of their Mini Exotic Candy Bars. 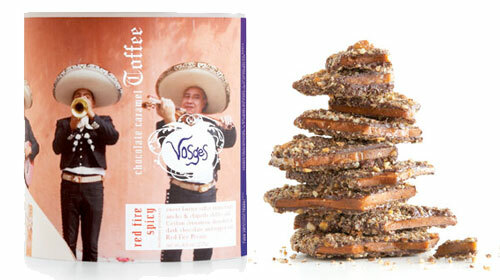 Dear Vosges: Please send me a box of your Red-Fire Chocolage Covered Tortilla Chips.